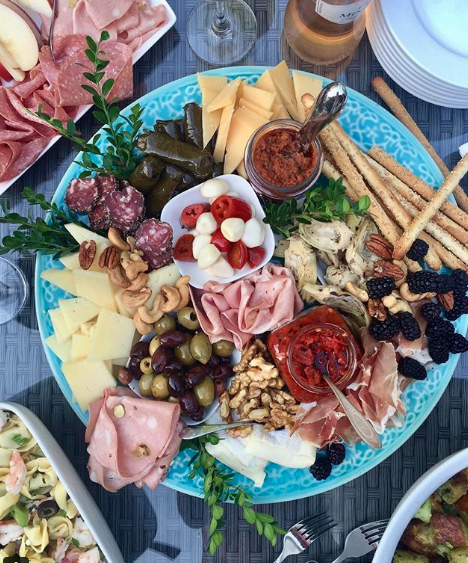 Have you noticed a lot of charcuterie boards in your Insta feed lately? Or maybe you've seen them at a party or on a menu (for a lot more money than you'd imagine). Charcuterie, pronounced (shar-KEW-tah-ree) is a fancy way of saying meat and cheese platter. Many catering companies, as well as at-home chefs, are setting the bar high in terms of beautiful board presentation. Fear not, for assembling a charcuterie board is much easier than it looks. We'll break it down for you and give you plenty of decorating tips and tricks so you can assemble your own board at home — for much less than you'd pay at a restaurant. Your friends and family will be pretty impressed too. You can start out by heading to your favorite grocery store to buy a mix of your favorite meats, cheeses, nuts, breads, crackers, jams, sauces, fruits, veggies — the possibilities are endless. The best part is, you can use up leftovers from your fridge or pantry too. It's completely up to you what you put on your board. For the board itself, you can use any pretty platter or wood cutting board you already have. If you're feeling ambitious, you can go out and buy a nice board like this round marble one or a more traditional wooden option like this. Read on for the best charcuterie inspo and get ready to make your own gorgeous meat and cheese boards at home. You'll be amazed at how creative you get and how much money you save by making them yourself.